You are currently browsing the tag archive for the ‘Porsche’ tag. The other day, I talked about the new gas mileage law, which will require car manufacturers to increase the fuel economy their fleets obtain by 2016. For the environment, this is a step forward, leading to decreased overall carbon emissions and better mpg’s in cars. Naturally, this will also increase new car costs as car makers dump resources in R and D to create more efficient vehicles. But this bill might provide an unexpected injury to another part of the auto market: the luxury car industry. Will James Bond have to give up his trademark Aston Martin? Remember that car manufacturers must have a fleet average of about 35.5 miles per gallon. For large companies like GM and Ford, this is pretty feasible, considering the high number of models these firms produce. Even lower-end luxury brands like BMW should be all right meeting these standards, especially considering the high mileage makes already coming out. But what about the really high-end performance cars like Porsches and Aston Martins? If the makers of the fast cars are large manufacturers, these regulations should be pretty easy to overcome. Consider Ferrari, which just released the fastest road car in the company’s history, the 599 GTO. Ferrari is owned by Fiat SpA, which luckily is already selling fuel efficient vehicles in the US. But brands that don’t sell cars besides luxury autos in the US are scrambling for ways to meet this regulation, like developing smaller, more fuel efficient cars (both Aston Martin and Jaguar are trying that route). Tiny (fewer than 5,000 vehicles sold per year) manufacturers are hoping that the EPA makes special allowances for them since the government agency has said these companies will get their own rules. Larger car makers (50-400k cars) are allowed to have 25,000 cars per year exceed mileage targets without being penalized. And let’s not forget that fuel efficiency and carbon emissions regulations are not unique to America. Most developed countries in the world have to adhere to standards which get more strict all the time. In fact, the US is lagging behind in the regulations game. So what exactly does this mean? Will our favorite high performance car makers be able to punch out a few efficient models to keep the sportiest vehicles on the road? I’ve said this before – I love fast cars, even if I may never own one. But can they remain on our highways indefinitely? Or will there come a time when they’re chained to closed tracks? Maybe others agonized over a similar decision decades ago when horses were replaced by horsepower. Maybe carriage drivers were sad to put their high-stepping ponies in the barn and resigned themselves to riding and driving them for sport instead of transportation. Will luxury cars as we know it be kept merely for hobby instead of a way of getting around? I know that most Aston Martin drivers aren’t slogging through their daily commutes like James Bond, but these new regulations may dramatically change the fast cars we all love. The divide between transportation and sport might keep growing. I’m going to be honest here. I don’t drive the greenest car at this moment in time. It’s a ’94 Toyota 4Runner that gets about 20 miles to the gallon. It’s not terrible, but it’s not great, and will likely meet its death soon due to various health problems. For anyone who’s not quite sure what a 4Runner is like, just picture the kinds of SUVs that cruise around the African desert, the kind that can go through monsoons and still look all right, or even the kind that can sit on top of an exploding building and drive away from the wreckage (at least I’ve been told they can do that). My car’s pretty sturdy, which has let to numerous people believing they should bomb around in it as a rally car. Because I do indeed like my car and need it to get around, I have politely declined all these years. Perhaps I’ll let someone take it on one last hurrah before it’s retired. Rally car? I guess! This guy's all set for e-Miglia. One rally my car won’t be participating in is the new e-Miglia rally, slated to happen August 3-6. The rally is open to four different kinds of electric vehicles, including two, three, and four-wheelers, as well as hybrids. The rally is organized by the same people who put on the Transsyberia Rally, but e-Miglia will run over paved roads between Germany and Italy, focusing on how well the electric vehicles run and their overall consistency. There’s 10,000 Euros in prize money to be had, which should give some incentive to fill the 50 open slots for drivers. Electric rally car? Not so much. The original Miglia rally, the Mille Miglia, ran almost 25 times between 1927 and 1957 and helped to showcase some of the nicest car companies in the world (Porsche or Ferrari, anyone?). The goal of the e-Miglia rally is to do the same for electric cars: put them in the spotlight and show off their sportiness, reliability, and versatility. These electric cars probably won’t be cruising through the bogs like other rally cars, but hopefully the event will raise awareness to everything that electric cars can do. Wanna join the rally? Check out their website (speaking German is a plus there) and book your plane tickets. Apparently all you need is a driver’s license and an EV! So I was going to write about the 2010 World Sustainable Energy Days going on in Europe this week, but then I saw a picture of this car and lost my train of thought completely. So enough with the serious stuff. 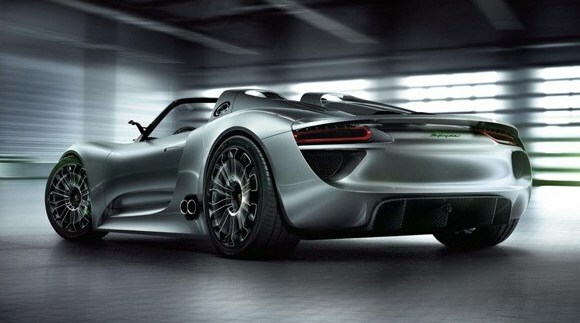 At the 2010 Geneva Motor Show, Porsche unveiled its latest concept car: the 918 Spyder Hybrid. Just…just take a look before doing anything else. Grab a towel first to wipe up the drool. All right, now that we’ve seen that this car is gorgeous, let’s talk about what it can do. When it was first written about, it was said the Spyder could get 78 mpg, zero to sixty in 3.2 seconds, and 198 mph top speed. Sounds pretty sweet, right? Well, those numbers aren’t exactly accurate. According to a New York Times review, the Spyder has four separate modes ranging from all-electric to hybrid to full-bore sports car, and those numbers come from different modes. 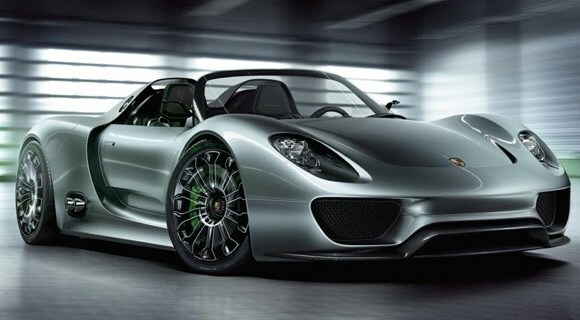 It has a 500-horsepower gas engine and two electric engines, one on each axle, for a total of 718 horsepower. So this concept car isn’t an absolute super-car. But I think it goes a long ways towards showing that you can have the beauty and speed of a fun sports car with some environmental benefits, too – it doesn’t have to be one or the other. It’s still a concept car, but I’m hoping it goes into production. Not like I could ever afford it, but it’s nice to know that there are green options at every level.